First, some very exciting (and belated) news…Karl is spending the summer in Boston with me, studying for his board exam, which means our long-distance relationship is sans long-distance for a couple months! Throughout the entire span of our relationship, I am pretty sure there have only been five mornings when Karl has gotten up before me (and that is a liberal estimate). I jump out of bed like it’s Christmas as soon as the sunlight hits my eyelids, while Karl, like a snail’s eye, will slowly retract under the covers if you try to wake him up. There is a little morning game I like to play – wake up Karl. It’s a very delicate game, and I win about half the time. 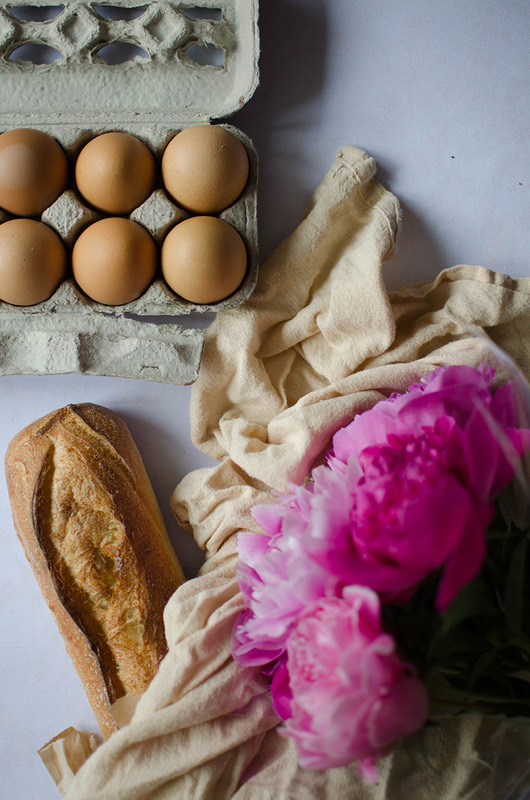 The Somerville farmer’s market in Union Square is up and running, and in order to get the good stuff, like farm fresh eggs and flawless flowers, you have to stop by early. On Saturday morning, I won my little game of rousing Karl and bribed him with coffee and donuts to go to the farmer’s market with me. The farmer’s market, small and bustling, was such a treat. 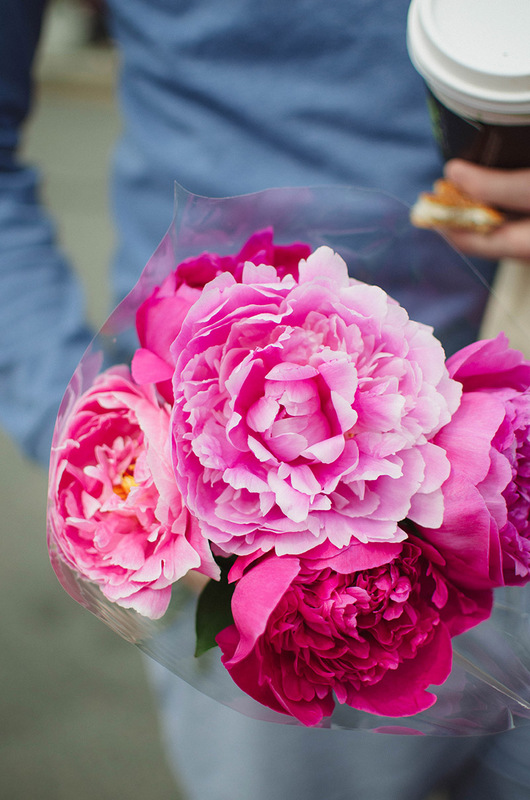 I got my fresh eggs and gorgeous peonies with my love by my side who was blissfully sedated by his donut. My heart was completely content. Nighttime is Karl’s prime time. In the evenings, when Karl needs a study break and I need something sweet, we like to take the subway to the North End, where the smell of white wine and garlic surrounds the entire neighborhood like a bubble. There are many tiny crowded Italian restaurants that line the narrow cobbled streets of the North End- it’s easily my nose’s favorite place in Boston. Aside from the glorious Neptune Oyster, Karl and I haven’t tried restaurants in the North End yet. We usually go for the gelato and/or cannoli (usually it’s and). On Saturday, I could not wait any longer to get my hands on some North End-y pasta, so I made my own. With white wine sauce and garlic. And cream. And lemon juice. And shrimp. 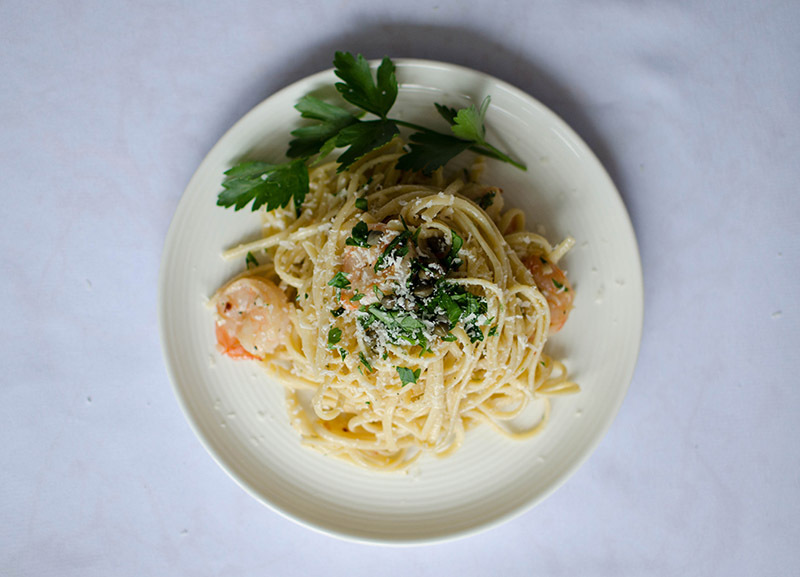 After doing lots of research on the North End menus, I made a creamy pasta dish that is absolutely divine and slightly adapted from Tyler Florence’s Shrimp Scampi with Linguine. 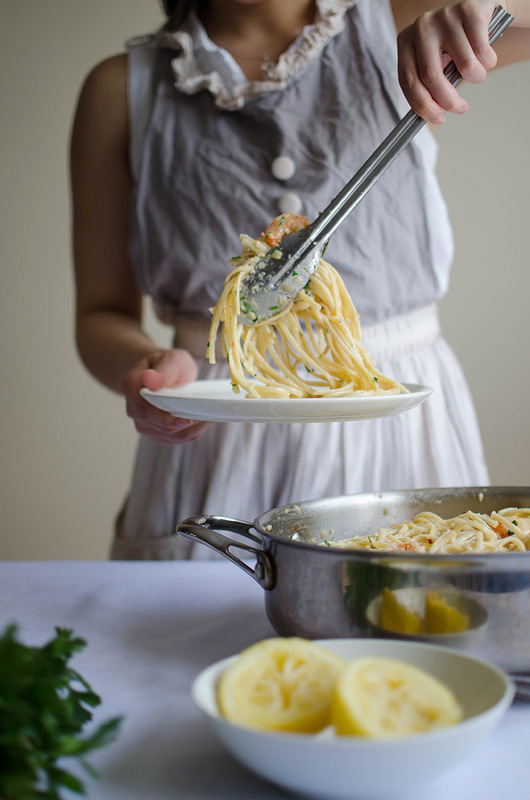 Creamy sauces in general can be heavy, but with the addition of lemon juice and chopped parsley, perfect balance is easily achieved. 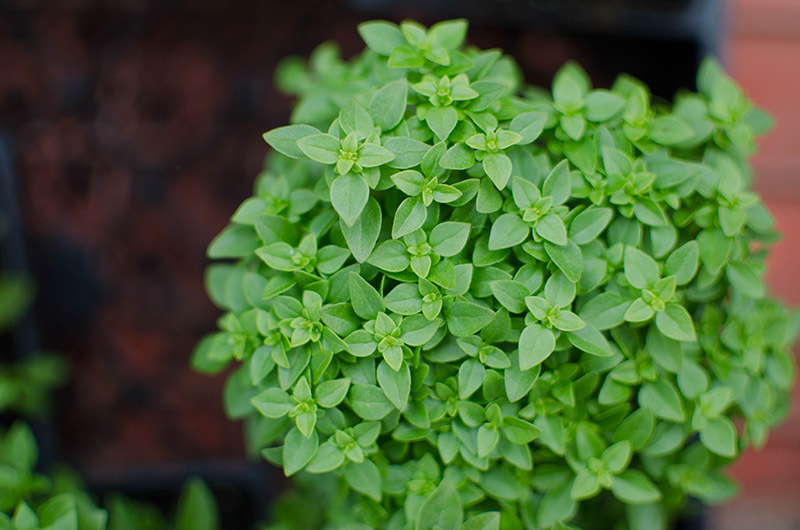 Bring a large pot of water to boil and season with salt. Add the linguine to the boiling water and cook until al dente, about 9 to 10 minutes (follow the instructions on the package). Drain the water, then rinse the pasta with cold water. Drain the water again, then add the olive oil. Stir until coated so that the pasta does not stick together. In a large saute pan, melt the butter over medium heat. Add the shallots, garlic, and red pepper flakes. Cook until the shallots are soft, about 3 to 4 minutes. 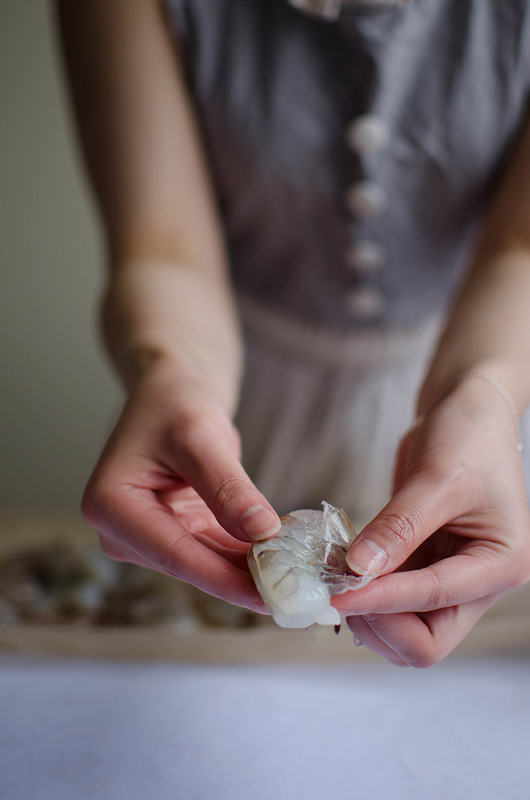 Add the shrimp and ½ teaspoon salt. Stir and cook the shrimp until pink, about 2 to 3 minutes (careful not to overcook). 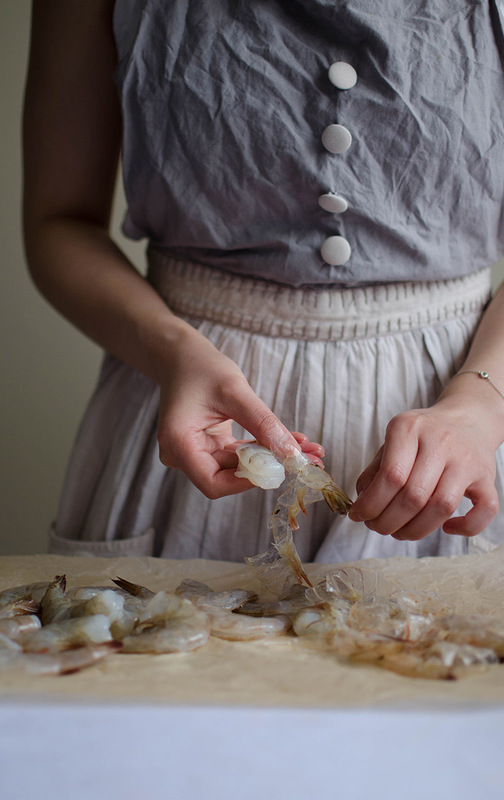 Plate the shrimp, then set aside. Add the wine and lemon juice to the saute pan. Bring to a boil, then reduce the heat and simmer for 7 minutes. 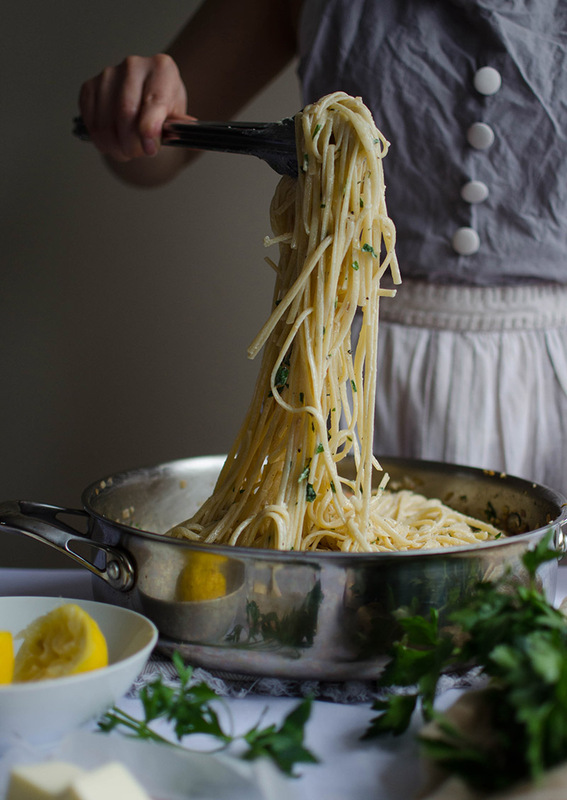 Add the heavy cream, parsley, and ½ teaspoon salt, then simmer for another 2 minutes. 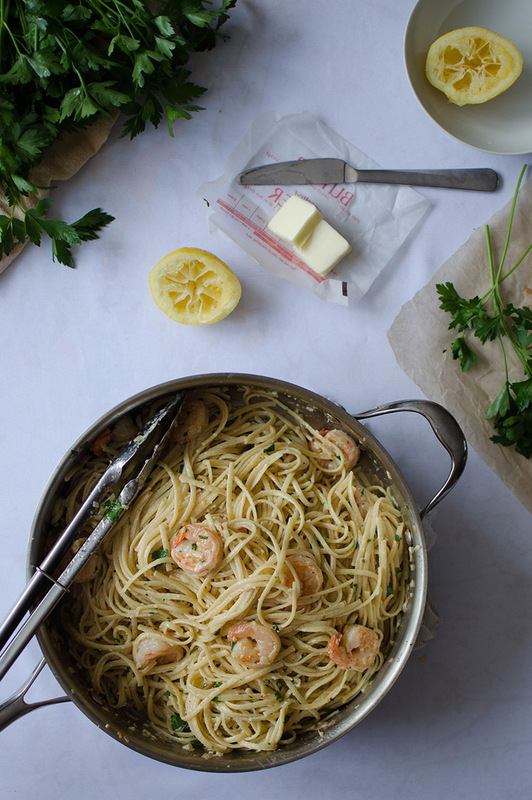 Return the linguine and shrimp (with the juices) to the saute pan. Stir in the capers and parmigiano reggiano. Season with freshly ground black pepper and salt to taste. Remove from the heat, then serve warm. 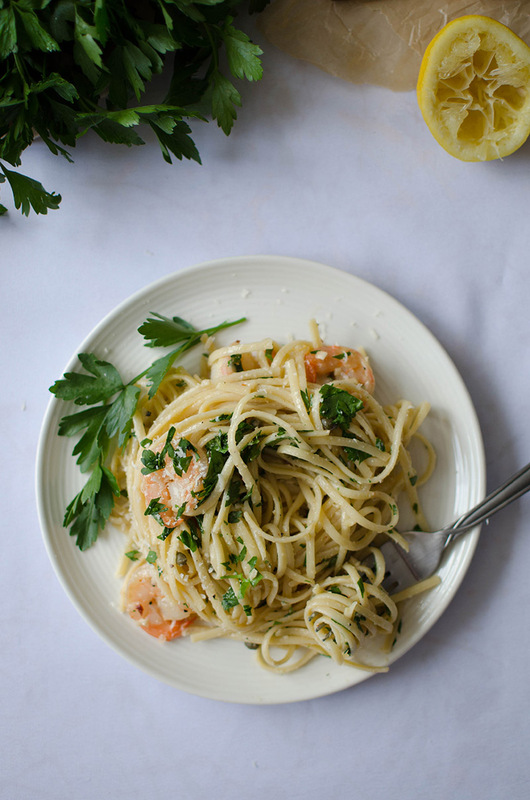 This entry was posted in Entrees and tagged capers, heavy cream, lemon, linguine, parmigiano reggiano, parsley, pasta, seafood, shrimp, white wine. Yumm!! 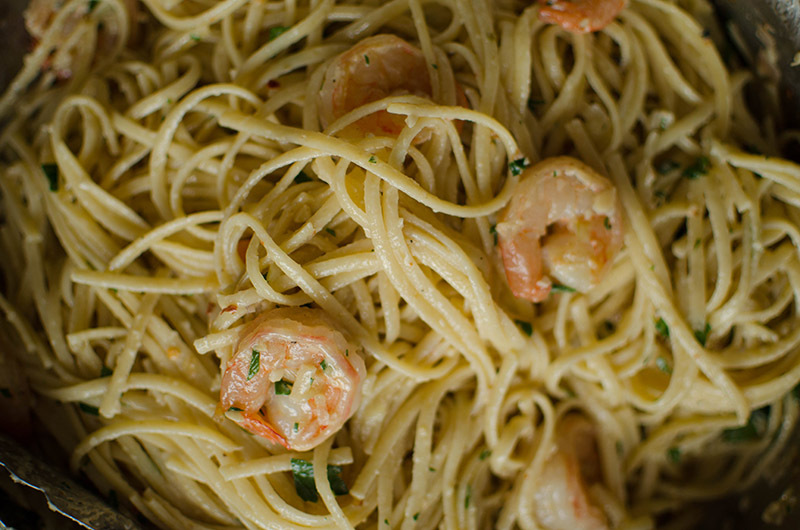 *drools* I’m eating lunch in the library right now and the drools are really happening when I see these pics of your creamy shrimp linguine! 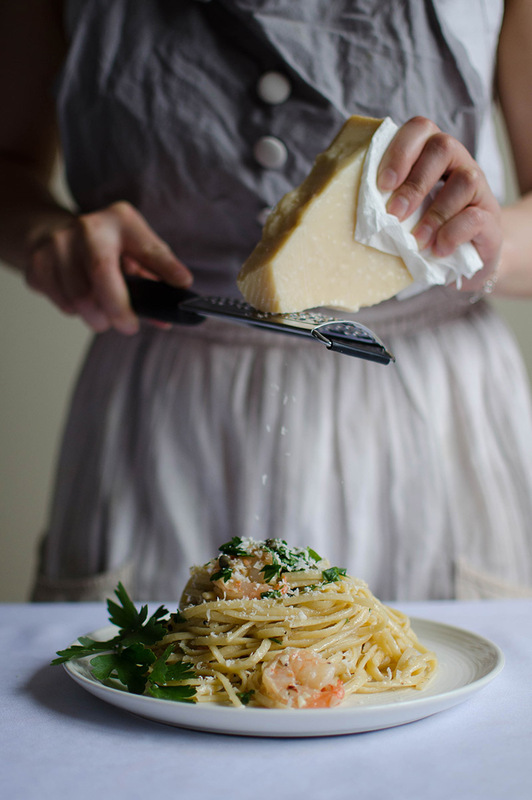 It looks like a dream – creamy pasta sprinkled with cheese is the best (also shrimp! possibly my favorite source or protein). Shrimp is probably my favorite source of protein too!! I love it in everything …everything savory that is! My dad had to get us up for school too, and now that I’m thinking about it, it was quite hilarious. He would definitely tickle our feet, sometimes pull the blanket off of us, and occasionally sing songs really loudly until we got out of bed. Have you heard of those alarm clocks that roll around on the ground when it goes off, and you have to chase it to turn it off?? heheh I think they’re pretty effective! 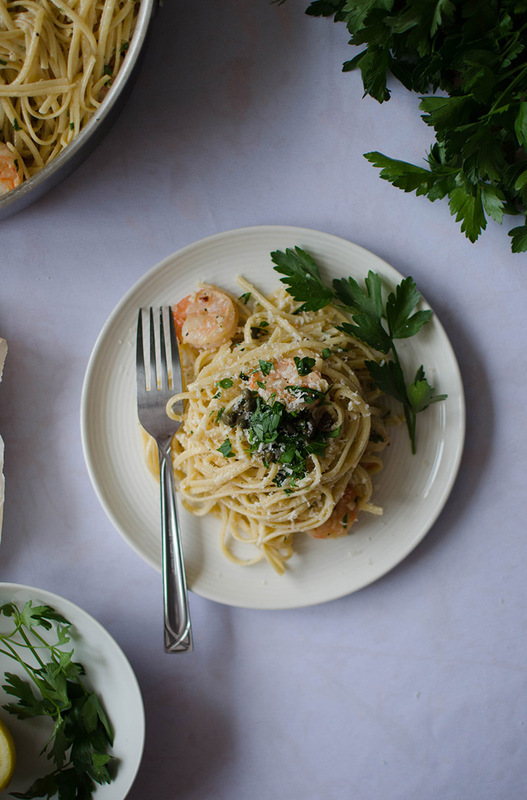 Cream, pasta, shrimp, garlic, wine, red pepper, cheese – so so good! and your photos are beautiful – and so are you! I’m glad you’re rousting that sleepyhead out of bed to join you some mornings. But I guess he’s on vacation, sort of! Aww karl!!!! We must get together. Also, your outfits are always so cute. I’m always in something I slapped together last minute, usually relying on my apron to cover my shabby outfit. Hahaha thank you so much Betty!!! 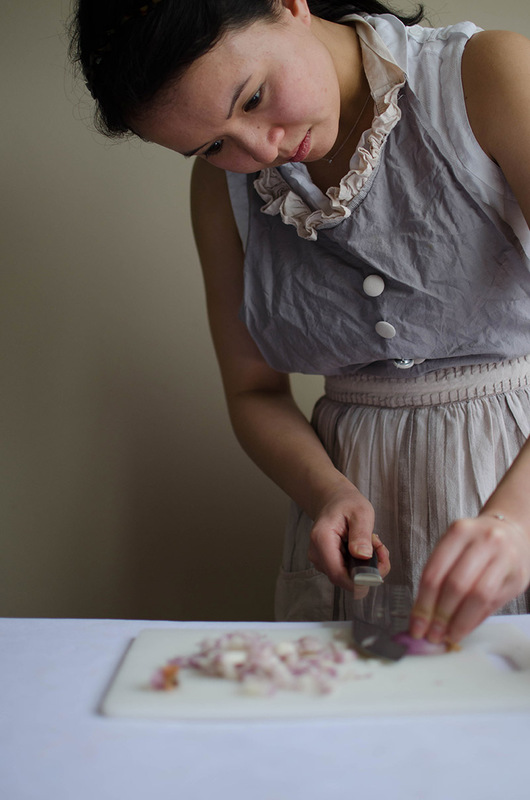 I think it’s hard to tell, but what I’m wearing is actually a “vintage” apron I got from Sur La Table :p I’m totally cheating. We definitely need to get together! I’ll email you soon to set a date! I know you’re probably really busy right now with workshop stuff!! Thanks so much, Ellie!! <3 And OMG I didn't know you lived in Argentina!! That is *so* cool!!! Long distance is so hard, but I am counting down the days until I'm back in California! !